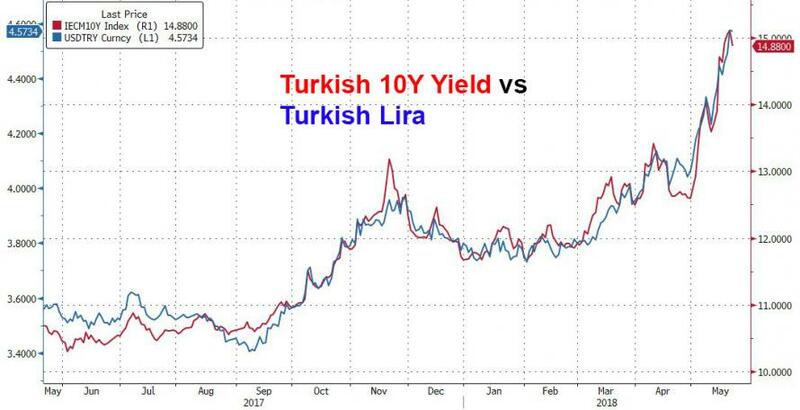 Trader: "Turkey's Goose Is Almost Cooked"
Yesterday, Bloomberg macro commentator and former Lehman trader Mark Cudmore delivered an unpleasant dose of reality for those ostriches whose heads were still stuck in Italy's sand, warning that "Italy Is On The Verge Of Inducing Fresh European Crisis." Today, Cudmore takes that other, well-known "sick man of Europe", Turkey, and in typical fashion, he refuses to mince his words, warning that "Turkey's goose is almost cooked" noting that while the country's central bank may be forced to hike rates before its next scheduled meeting in two weeks, "Turkey is in the midst of a true currency crisis and is losing the luxury of choice" as the "lira is capitulating, helping inflation soar and rapidly worsening Turkey’s external debt situation." Cudmore's full note is below. Turkey’s next scheduled monetary policy meeting is a little over two weeks away. Market dynamics suggest the central bank will be forced to hike rates aggressively before then. There’s plenty of precedent: Turkey conducted emergency rate hikes within days of scheduled policy meetings in 2006 and 2014 -- and it should be emphasized that Erdogan was also the political leader on both those occasions. Unfortunately, Turkey is in the midst of a true currency crisis and is losing the luxury of choice. The lira is capitulating, helping inflation soar and rapidly worsening Turkey’s external debt situation. Its net international investment position was a deficit of $468.7 billion as of the end of February. The lira has already fallen more than 10% this month versus the euro-dollar basket. Brent crude is up 19% this month in lira terms. As a major energy importer, such a pace is unsustainable for the economy. And the dynamic isn’t self-correcting, which is why the central bank will be forced to step in. The large FX liabilities of the corporate sector means the pain intensifies, rather than alleviates, with currency weakness. A currency-fueled inflation- spiral -- April CPI at 10.85% year-on-year and PPI at 16.37% even before the latest lira losses — is leading to a massive and rapid erosion of household wealth. 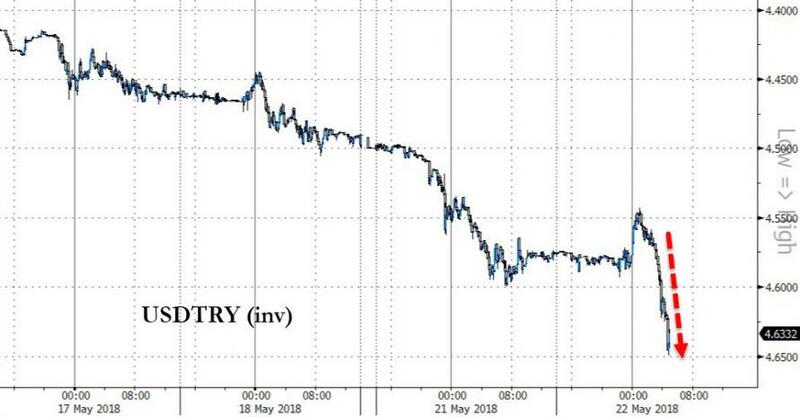 The threat that poses, especially when combined with a rapidly widening current-account deficit (thanks to those hefty energy imports), should at some point overwhelm any allegiance to Erdogan’s personal economic theories for central bankers who are — for now — officially independent.